NRBQ is one of those funky, off-kilter groups that music critics love but the fans never quite warm up to. At least not enough fans for the band to ever break through into the big time. And so for some three and a half decades, NRBQ has plied the indie circuit, playing nightclubs, bars and coffee houses instead of the arenas and amphitheaters their small but zealous base of fans believes they deserve. There's no denying their talent  the four members of NRBQ are gifted, skillful musicians who play with passion and virtuosity. But the reason NRBQ has never had a major hit is they've never written or recorded a really catchy song that would make it on the radio. Their new album, "Dummy," doesn't have any songs that will break that streak, either. 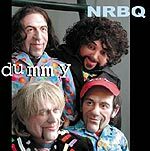 It is your typical NRBQ album  full of charming, melodic songs that manage to be pleasant without ever having a hook to get stuck in your head. And the band's trademark off-center sense of humor remains in full bloom  not so different from that of Randy Newman. Of course, take away "Short People" and "Toy Story" and Newman would have escaped the general public's attention, too. NRBQ fans will love the album; those who don't get the band still won't find illumination.